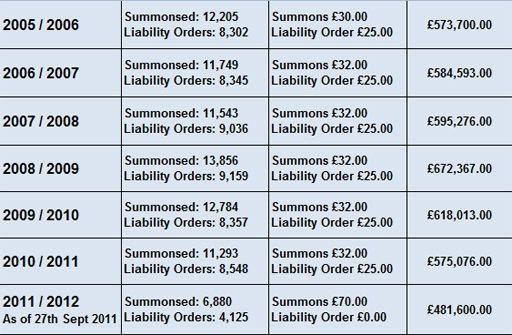 The figures for Bristol Council Tax summonses and liability orders are in, and very interesting reading they make. With 166,380 households, the council produced 22,700 chargeable summonses in the last financial year, giving a summons-to-household ratio of 1:7. However, with a single fee of £103, the council is way on top of the league in its fee level, grossing £2,338,100 in the last financial year and pulling in over £28 million since the charging scheme started. But what is especially interesting about Bristol though is that it is one of the few councils that has been asked to justify its charges and its answer very much conforms with what we were told yesterday. We do, though, seem to have a slight variation on a theme. The authority assigns a notional percentage of staff time spent on "recovery and enforcement", then applying that percentage to the overall cost of the revenue collection operation in order to work out its summons cost. Thus we see in 2007/8, 27.3 percent of the staff time – amounting to 21 full-time equivalents - allocated to "recovery and enforcement", which means that the cost of sending out a claimed 16,000 summonses is that percentage of the £5.7 million total budget – or £1.6 million. Some of the tasks specified, that the costs supposedly cover, are set out here. By any reckoning, charging a single fee to cover summonses and liability orders cannot be legal. If the council sends out a summons, and they get a payment by return, it has incurred nothing more than the cost of sending out a mailshot, very similar to sending out a final notice, which is also a statutory document. And here, from Nuneaton and Bedfordshire on 26 October 2010, we get the cost to the authority of producing a final notice, including stationery, printing, postage and staffing costs is £1.22 per notice. Even adding a certain amount of extra processing to get the court approval for the summonses, you would be very hard put to it to double this cost, which means we are talking of a huge rip-off. Then one comes to the liability order, where the law states that the costs apply to obtaining the order. There is not the remotest sanction for ladling in all the follow-up costs, which has Bristol allocating the costs of 70 percent of the 23-strong "customer services team" to recovery and enforcement. What Bristol officials have not actually worked out is that, with 21 staff (FTEs) allocated, that amounts annually to over 35,000 staff hours devoted to its notional 16,000 defaulters. That gives them over two hours each. Council officials could afford to hand-deliver each summons and sit down with defaulters to discuss payments over cups of tea. As the evidence builds, therefore, it becomes more and more clear that officials are abusing the system. And up there in the premier league reside the Bristol Bandits. The first ten results from the survey of Council Tax summons and liability order costs are in and processed, shown in the table above. The figures relate to the financial year 2010/11. Fees are those prevailing at the time – many have increased since. What comes over is the huge range of results, even in this very small sample. The outright leader is Bradford MDC, sending out 48,577 summonses and charging over £3.2 million, compared with Craven with 1,432 summonses, charging £95,680. In relative terms, though, when expressed as a ratio of summonses sent compared with the number of households, Bradford is still leader of the pack. It sends summonses to one in four households – four times as many, pro rata, as the lowest scorer, Craven District Council. Just to emphasise this, one in four households in Bradford get a summons - at £55 each. This is not debt recovery. It is big business. Interestingly, Calderdale, the second-highest charger – in relative terms (joint second with Ipswich) is also a West Yorkshire Council, charging £1.2 million – almost as much as the London Borough of Bromley, which has fifty percent more households. It will be instructive to see what the other W. Yorks councils are doing. 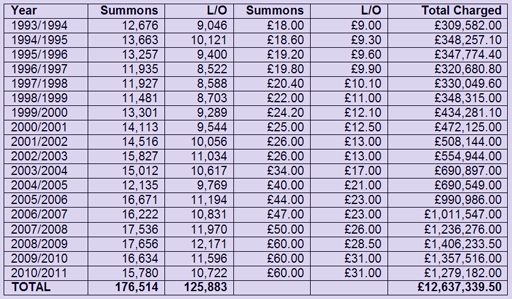 As well as the range in the numbers of summonses, there is a huge discrepancy in fees charged, ranging from £57 at the lowest (although this has gone up), to £100 in Ipswich. Given that this is supposed to be based on actual costs incurred – which must be broadly similar – there is no obvious reason why this should be so. To remind readers of the question, this is below. For most local authorities, all it takes is an e-mail. None have so far refused to answer, and there is no charge. Please supply information on the number of Summonses and Liability Orders issued by the Council in respect of Council Tax, for each of the financial years since April 1992 to the present, itemised separately by year and document type, and the total fees charged for each year (specifically for the two documents), again itemised separately by year and document type. More results are coming in, at a fairly steady rate, and I will post them on the blog – with a commentary – as and when I have processed them. I should imagine that, as more results come in, the rankings will change, but we have a long way to go with 326 English authorities to look at. The European Commission has threatened to take legal action against Britain if ministers do not water down rules limiting foreigners' ability to claim benefits - says Iain Duncan Smith, the Work and Pensions Secretary in The Failygraph. He adds that the commission's move is part of a "wider movement" by the "unelected and unaccountable" European authorities to extend their power over the UK. But the story is a pile of horse manure. What the commission has actually done is "request" the UK to end "discriminatory conditions" on "the right to reside as a worker" which exclude from certain social benefits nationals from eight of the ten member states (Czech Republic, Hungary, Slovakia, Slovenia, Latvia, Lithuania, Estonia, Poland) that joined the EU in 2004. According to the UK Worker Registration Scheme, nationals from these countries who stop work before completing one year with an authorised employer do not have the right to reside as a worker. This right to reside is one of the conditions of UK legislation to qualify for Housing Benefit, Council Tax Benefit, Crisis Loans, and allocation of social housing and provision of homelessness assistance. Without this right to reside ("Right to Reside Test") nationals from these member states are currently excluded from receiving these benefits. The commission considers that this is contrary to the transitional arrangements on the free movement of workers. These allowed the UK to restrict nationals from the 2004 enlargement group, refusing them permission reside in the UK until the end of April 2011. Crucially though, these provisions already apply to the nationals of other EU member states, and the seven-year transitional arrangements were ratified by the Blair government in 2003, as part of the accession treaties. Thus, if Iain Duncan Smith has cause for any grief, it is with Blair's government, not forgetting that the Tories were in favour of enlargement and would have agreed exactly the same deal. However, on the eve of the Tory conference, it is essential that the Tories demonstrate that they are true "eurosceptics", so here we go with faux eurosceptic stories pouring out of the woodwork, to keep the faithful happy. And they fall for it every time. Another result is in from the survey of Council Tax summons/liability order costs – this one from NE Lincolnshire. From a tax base of 69,171 households, it took in £575,000 in fees from over 11,000 summonses in the last full financial year, thus emerging in the top ranks of charging authorities, with one in six households getting a summons. What is highly significant, however, is the internal council budget document for 2011, which puts "summons costs" in the category not of cost recovery but of "income generation", the council aiming to increase revenue by £188,000 for this and the following three financial years (see below). Six months into the financial year, the local authority seems well on target, with an income of £481,600 so far, compared with £575,076 for the full financial year of 2010/11. It seems to have achieved that by upping the fees to £70 from £57, and also combining the charges into a single element. This single fee means, of course, that people who receive summonses from NE Lincs and pay immediately on receipt still get charged for liability order hearing costs and the associated paperwork. Since this is not authorised by the Council Tax (Administration and Enforcement) Regulations 1992 – see S.34 subsections (5), (7) and (8), which set up staged charges – it must be unlawful. The council should not be making this combined charge at all. It should be charging separately at each of the two stages. The combination of a 22 percent increase in fees, however, plus combining the charges, has given the council its boost in income, the officials having completely lost sight of the fact that they are imposing their levy on some of the poorest and most vulnerable in their community, from whom they are only allowed to cover "costs reasonably incurred". Further insight into the charging scheme comes from a finance officer in another local authority. He tells me how charges are calculated. Basically, the cost of the entire revenue collection operation is assessed, from which all costs incurred up to the summons stage are deducted. The remainder is then divided by the average number of summonses, and then the gross figure is (in most councils) split arbitrarily between summons and liability order. In effect, once the bills and reminders have been sent out, debtors are paying for the entire cost of the collection operation. This is not what the legislation permits – allowing costs only in relation to the application for and obtaining liability orders. Nothing there permits councils to make debtors subsidise their entire recovery operations. The trouble is that this institutional bad practice is now customary and has become so far detached from its legal base that it is regarded as just another revenue-generating opportunity. This turns it into what amounts to a stealth tax on the poor. No doubt NE Lincs chief executive Tony Hunter will be eternally grateful for the contributions though. 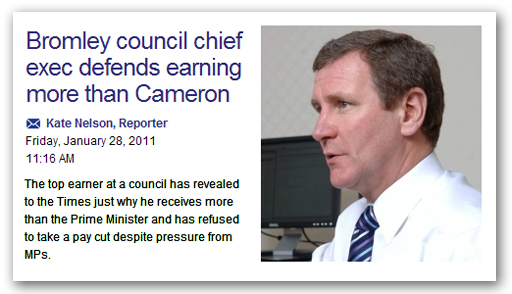 With a remuneration package of £184,667 – which included £31,610 annual pension contributions (more than most of his Council Tax payers earn) and £3,057 expenses allowances - he stands to benefit hugely from them. With the Deputy Chief Executive taking £152,970, the Executive Director Community Services on £147,238, the Executive Director Regeneration on £146,626, the Executive Director Business Services taking £146,168 and the Chief Financial Officer on £104,199, clearly these public servants also need all the money they can get from their poorest taxpayers. ... she was free-ish. The Bundestag has backed Merkel: 523 to 85, with three abstentions. And, like I sed ... it don't mean nuffink. All it does, as one of our forum commenters so aptly puts it, is end any lingering doubt as to whether the German political class will sell their people down the river. "This is a political construction … this is a political project" says the EU commission representative. Cut to Peter Oborne delivering extruded verbal material. I don't know why so many people believe this was a bravura performance as he dismisses the claim that the euro is a political project - which it is - and pontificates about economics … about which he knows little. Oborne is staking his reputation on the "guilty men" meme, but the comparisons are not appropriate, and the man is now coming over as a loud-mouthed bore. I'll say it again – the real guilty men were and are the journalists like James Kirkup, Fraser Nelson and, yes, Peter Oborne - who kept EU issues out of the media, and played along with Cameron who sought to suppress discussion on the EU. Oborne now lauds the Tory politicians who spoke against the euro – mentioning Hague on this programme – omitting to say that this man was the progenitor of "in Europe but not ruled by Europe". None of these Tories opposed the EU from principle, and even the Great Bill Cash sought "reform" rather than abolition. In his rush to re-write and re-interpret history, not once does Oborne mention Sir James Goldsmith. He is providing a smokescreen for the Tory europhiles, who saw political expediency in opposing British membership of the single currency, but nevertheless supported the EU as a political project - and continue to do so. I am sorry, but I'm not impressed by Oborne. I'm saddened that UKIP – as so often – display their lack of political acumen, and rush to applaud this man on the basis of last night's performance. As one of Cameron's most ardent supporters, he is not our friend. He is the face of the enemy. With the nation poised on the brink of an economic catastrophe, the like of which may exceed in severity the Great Depression, The Boy steps in with an ultimatum … to supermarkets on their use of plastic carrier bags. Mrs EU Referendum suggests the best use for one such bag might be to secure it over Cameron's head, for all the good he is as a prime minister. That he should be addressing such matters says all we need to know. Technically, this is known as "displacement activity" where, unable or unwilling to confront the important issues, people turn to trivia and irrelevancies, using the activity to blot out matters they can't deal with. We are seeing the same with our media, as the pages fill with largely irrelevant tat and pointless clever-dickery. Sadly – even with the conference season in full swing - our national politicians have written themselves out of the script. They have become irrelevant, as great events play out elsewhere and the moral fabric of the nation continues to fall apart. One might expect a medical practitioner to take a professional interest in the death throes of a patient. For most ordinary people, though, the experience is distressing and, where unduly prolonged, is weighed down with an element of guilt-tinged tedium. That is where we stand with the euro, but as we hover by the deathbed in anticipation of the long-awaited demise, it is hard to decide whether the figure of the German chancellor represents the grieving relative, the physician – or even the assassin. Scanning the huge rage of comment on the issue, I am cautious of pronouncing – or even offering analysis – conscious that in such tense situations, much of what is said and done by public figures is for effect. It may not in any way reflect the truth of what they feel or intend, and most probably does not. A further problem – to which we have alluded many times – is that figures at the centre of a storm rarely have perfect knowledge or understanding. Rarely, in fact, do they have even the ability to decipher the very mixed messages pouring from the media and the many other sources. Centre-stage for today though is the vote at the Bundestag where Merkel will have to face hostile parliamentarians and somehow convince them that she should throw another shed-load of money at the Greek problem. Sentiment, we are told, "remains passionately divided". Some labour unions, oddly, are calling for measures to be supported, while the conservative Mittelstands und Wirtschaftsvereinigung (small business alliance) is urging deputies to vote "no". The politicians themselves are hopelessly split, and up to 19 rebels from Merkel's CDU may change the parliamentary arithmetic in an unpredictable way. However, in a Duke of York sense, we have been marched to the top of hill and down again so many times that it is hard to know whether we are either up or down. Whichever way the vote goes, though, it won't mean nuffink. And no amount of clever commentary or analysis is going to make any difference either. No one is in control any longer. The idea that "timely and decisive action" - even if it was possible – can pull us back from the brink is so much moonshine. We are all passengers of events. 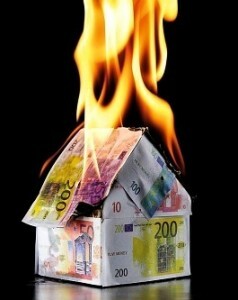 "A Greek default will trigger an immediate 'magnitude 10' earthquake across Europe ... Holders of Greek government bonds will have to write off their entire investment, the southern European nation will stop paying salaries and pensions and automated teller machines in the country will empty 'within minutes'." We really are totally domed. Hull is not yet on the menu and we have not ascertained the Council Tax rate for a residence in Hell, although the liability orders are of a completely different kind. That then leaves Halifax or, more specifically, Calderdale Council, which has responded with speed and efficiency to our FOI request. What is uncanny about these figures is that they yield a total charge of just over £12.6 million, within spitting distance of the total charged by the very much larger LB Bromley, with its population of 302,600 – against Calderdale's 200,100. A further apparent anomaly is that, while Bromley has sent out nearly 450,000 summonses and liability orders, the Calderdale total is only about 200,000 over the same 18-year period. Basically, in historic terms, the impoverished Calderdale up on the flanks of the Yorkshire Pennines, has needed twice as much cash as affluent Bromley to produce the same documentation. Currently, though, with Calderdale charging £91 for a set of documents and Bromley £95, while Calderdale's neighbour Bradford charges a "mere" £80, there does not seem a great deal of logic in the charging, even if it is taken at face value. Work on an actual cost basis and there is even less logic. One might be looking at an illegal overcharge approaching £12 million. And with the high volume of paperwork churned out, it is very had to avoid the conclusion that debtors are being used as an additional – and illegal - revenue stream. We have more answers to process and when those are done, I will produce a ranking – based on summonses and dwellings. In this, Bradford produces a startling result – one in four dwellings received a summons last year. Calderdale is not far behind, with one in five. 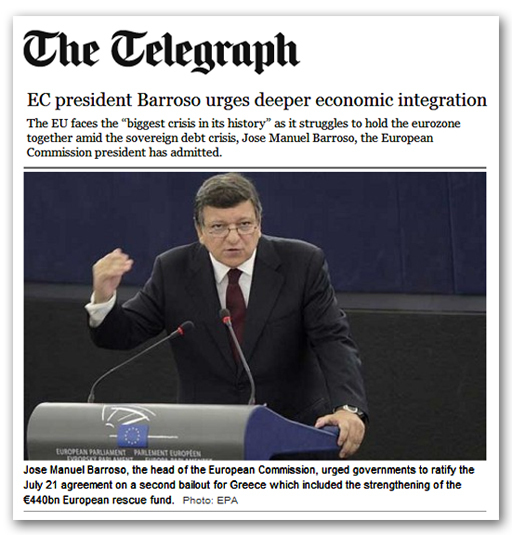 More integration, more "Europe" bleats an ever-more desperate Barroso from the depths of the bunker. There is no "plan B". This is the only thing they know, their solution to every ailment, the remedy for every problem. They are imprisoned by their own ideology. Even as the SS European Union capsizes and settles below the waves, they will be heard from within, tapping on the hull, screaming, "More Europe, More Europe". These people are domed. 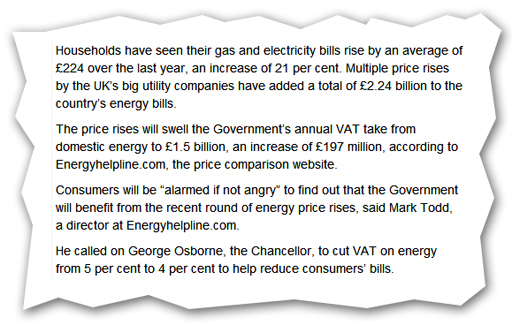 It is nothing short of outrageous that, in forcing up energy prices to pander to their green obsession, the government then benefits to the tune of £200 million in increased VAT. But, in calling for a reduction in VAT from five to four percent, you really think former MP Mark Todd would know better, even if it is too much to expect the Failygraph not to print his tosh. Under VAT rules, member states cannot reduce VAT levels on fuel below five percent without the unanimous approval of all 27 member states. We've been through this VAT issue before, many times. What does it take for these people to wake up to the reality that we are no longer masters in our own house? After refusing to take a pay cut, chief executive of Bromley council, Doug Patterson, says his £185,000 salary is justified because he "provides value for money". That, of course, is debatable. But the one thing which cannot be disputed is that he certainly rakes it in. The London Borough at the extreme south-east of the city is the largest in London, occupying 59 square miles and boasting a population of 302,600. In the last full financial year, 11,359 of those people received liability orders for non-payment of Council Tax, with defaulters paying £1,425,905 in fees for summonses, charged at £75 each, and the liability orders – a snip at £20 each. Altogether, since the 1992 Council Tax (Administration and Enforcement) Regulations, the Borough has issued over 50,000 summonses and liability order notices, extracting £13.2 million in fees – of which at least £12.5 million represents an illegal overcharge. With summons fees as low as £12 in 1994, the turning point in this revenue-generating scam came in 2006, when summons fees shot from £40 to £75 – where they remain today – generating for the first time revenue in excess of £1 million - see chart above. Despite the avarice, however, the population to liability order ratio remains relatively modest, at 1:55. The healthy revenue comes as a result of the size of the borough and the relatively high fees, totalling £95 for summons and liability order. Interestingly, in terms of costs, producing the liability order required £3 Magistrates' fees and court time for officials, making this document significantly more costly to produce. 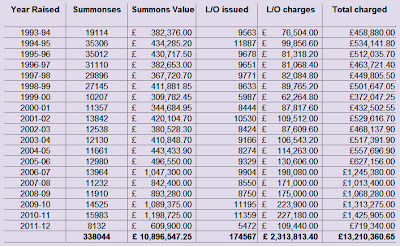 Yet Bromley chooses to top load the summonses, charging nearly four times the price of the liability order. This would tend to reinforce the claims that the actual fees levied bear no relation to the costs, and simply represent an easy – if illegal - "hit" against those least able to afford it, and least likely to have their complaints heard. Still, Mr Patterson can rest easily, knowing that his handsome salary is paid-for by the poorest and weakest in the community, with substantial change to spare. He could even afford a pay rise. The FOI requests are beginning to drift in now – but they come at me in different formats, with some councils sending information in spreadsheets and others in Word tables. They have to be processed so that I can publish them here, and that is taking a bit of time, so bear with me. This one is from East Hants District Council, a strong Tory area north of Portsmouth, centred on the town of Petersfield. With a population of 111,700 souls and 2082 liability orders churned out in the last financial year, it comes out lower than Runnymede, in the per capita ratio stakes, delivering 1:53 – representing one in every 53 people being served with an order. However, there are several interesting things about the charges. Firstly, the council combines the charge, currently £85, and applies it to all those who are summonsed. Thus, people are paying the full whack of fees, even if they pay off their tax immediately, without a liability order being made. With the legislation stating separately in respect of each document, that the council may recover "costs reasonably incurred", it can hardly be legal to impose charges on people for something that does not apply to them. Those who merely receive summonses should not be paying the same as those who also get liability orders. As to the level of the charges, we see the levy stating at £40 in 2004 and more than doubling six years later. If the fee was correct initially – and it was then certainly inflated – then to more than double it in the space of six years cannot be justified. 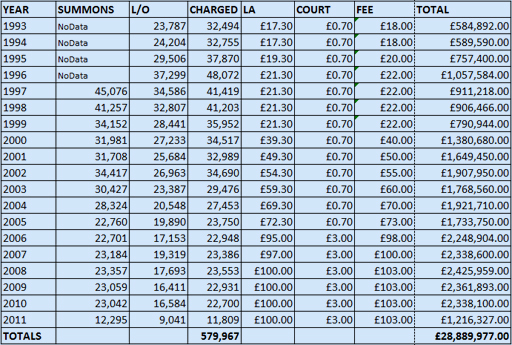 In terms of the total amounts charged, in 2004/5 we see the council pulling in £83,160. Six years later, it is taking £268,685. There can be little doubt that the council is using its debtors as an income stream – wholly illegally. But then, when your chief executive, Sandy Hopkins, is pulling in £125,000 from the payroll, plus two executive directors taking £91,000 each, the odd quarter of a million from the very poorest in your district can come in very handy indeed. At the heart of this Council Tax issue are examples such as these, this one from Basildon where the council is ripping off a widow on minimum wage, imposing charges of £45 for a summons and £50 for a liability order because the woman was late paying. What comes over is the chilling indifference of the council official, which is positively sinister when one appreciates that the bulk of the charge is almost certainly unlawful. But then, with chief executive Bala Mahendran on an annual salary of £155,904 and the senior management team taking £987,960 – plus pension payments and bonuses – one can see why officials need to be stealing the widow's mite. Continuing with the survey of charges made by local authorities, the latest result in is from Runnymede Borough Council, Surrey. This is a very prosperous part of the London commuter belt, with some of the most expensive housing in the UK outside of central London. 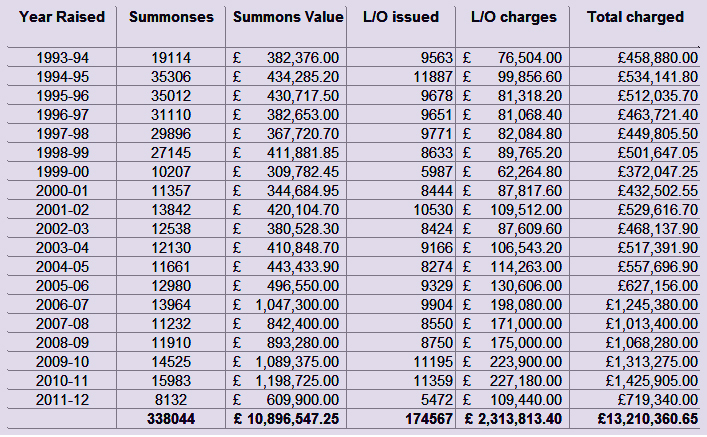 With a population of 84,000, comprising some of the richest people in the UK, it still found it necessary to extract £130,509 from 2,181 summonses and 1,626 liability orders during the last financial year – robbing some of the very poor to keep the rich fully serviced (chart above). Looking at this in the round, though, with three results from last year to evaluate – Bradford, Ipswich and now Runnymede - I'm looking at ways of comparing the data. One such is to relate the populations to the number of liability orders issued, ratios which yield interesting results. If we take the wealthy Runnymead, we see a ratio of 1:51. Ipswich, with its population of 122,300 and 4,803 liability orders, yields 1:25. Bradford, on the other hand, with a population of 501,700 (and they call this local government ... there are countries smaller) and 32,428 liability orders, delivers a ratio of 1:15 - essentially, one person in fifteen gets a liability order. There are too few results yet to come to definitive conclusions, but this tiny spread certainly would support a claim that the councils are systematically robbing the poor. As my erstwhile co-editor observed, you can always tell it's party conference time – the Tory europlastics come out to play … and then teacher slaps them about a bit. It the play goes according to script, the plastics get all precious and outraged, the Failygraph gets a headline or two, and then everybody goes back to sleep until the next conference. Actually, the script has changed. The EU is a mortally wounded creature. It may take a long time dying, but it will become increasingly irrelevant as time passes, the economic crisis takes hold and nationalism re-asserts itself. We are already seeing that in Germany. Hence this report that Germany's top judge has issued a blunt warning that no further fiscal powers may be surrendered to Europe without a new constitution and a popular referendum – something not heard of since Hitler's time. To mention the "r-word" in Germany is tantamount to blasphemy. To get a political judge doing it – calling for popular involvement – is staggering. The real game in town, therefore, is – or should be – how we, the people, bring the aliens who have taken over our government back under control. But since the aliens are making the most noise at the moment, and the media aliens are listening to them, their chatter is drowning out the more important issues. For the moment though, there is no great harm in letting them play, while the grown-ups get on with the real work. Their reckoning will come soon enough. The Labour Party conference may be in full flow, but I have to confess that engaging with the political posturing is more than a little difficult, when so much is going on elsewhere. Mind you, even the slow suicide of the euro – alongside the Greek economy – seems a little unreal, and it is very hard to share even Jeff Randall's preoccupations as he and many other commentators have very little new or interesting to say. It is, in fact, all very well getting worked up about macro-economic issues, but what really matters to us all, first and foremost, are our own personal micro-economies. Such are the conditions that are developing that these may well devolve in the near future to questions of whether we can afford to buy enough food and afford to heat our frigid homes as the winter sets in. On this, I am still haunted by the piece yesterday which records the assault on the Greek middle class, focusing on one couple Dmitris and Mary Andreou. What was chilling was not only the double assault of increased prices and reduced income, but also an extra property tax of between €500 and €1,000 a year until 2014, and a further income tax hike. Sentiments not dissimilar to those expressed in Greece are also being heard in the UK and yesterday we saw The Scotsman reporting that Scotland's nursing staff are "at breaking point", with a survey showing they are suffering "plummeting" morale, financial worries and a complete collapse in job security. That message can be repeated across a wide spectrum of occupations, in both private and public sectors, and the great fear is that the collapse of the euro and the certain default of the Greeks, will bring with it a massive economic downturn that will make an already bad situation much, much worse. And if that is bad enough, what is really terrifying is the government at different levels which has not yet learned to temper its insatiable demand for our cash, but is developing ever more inventive ways of extracting hidden taxes – such as parking fees, income tax penalties and a whole raft of imposts – and is resorting increasingly to bully-boy tactics, with the use of bailiffs and other forcible measures to fill its coffers. If the markets are currently ruled by fear, as the above chilling clip asserts, so are our daily lives, as private economies contract and the predators move in. And first and foremost amongst those predators – as the Greeks are finding – is the government. The party conferences are the shop window for the political classes, but behind the smiling faces and the honeyed words, a government of aliens has declared war on its own people. Its insatiable appetite for cash does not allow it to do otherwise, and it will destroy us rather than reduce its own demands. Like the shark, it must keep swimming forward or perish. All of this makes me very pessimistic for the future - more so than I have ever been - and it makes today's battles all the more relevant. These are not jolly little japes, or little local squabbles, but part of the battle for survival which is increasingly going to engage us all. A fight we have evaded during the good times is now going to have to be fought when we least want it. It is one where the rule of law has been abandoned, and no quarter is given or taken. The rule of fear is about to descend. It having become apparent that my local council, Bradford MDC is systematically defrauding ratepayers of millions of pounds each year, in common with most other councils in the country, we have embarked on a series of Freedom of Information (FOI) questions, to smoke out the full extent of the fraud, with some questions answered and more coming in. However, this was never going to be that easy, as the fraud goes all the way to the top. It was entirely predictable that the councils would seek to protect themselves. And, in the vanguard of criminality, we find Bradford now refusing, point-blank, to answer the questions put. Says Neville Birkett in an e-mail to me today - a man who laughingly embraces the title of Freedom of Information Officer - I am now of the opinion that exemption 14. 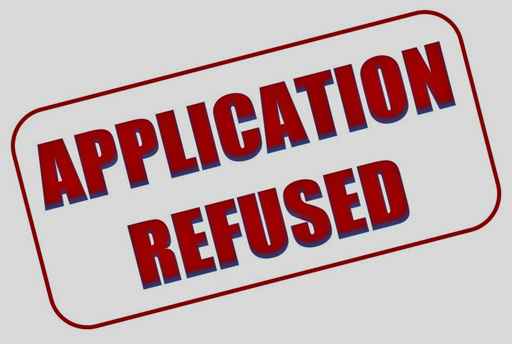 – (1) Section 1 (1) which does not oblige a public authority to comply with a request for information if the request is vexatious applies to your requests. "I have", he writes, "based this opinion of the context and history of your correspondence which I would characterised as obsessive and of no serious purpose or value as defined within the ICO's guidance notes". Thus, he concludes: "I am therefore issuing a refusal notice against your last four Freedom of Information requests". 1. In respect of the preparation of summonses and liability orders in relation to financial years 2010/11 and 2011/12, please could you itemise separately in respect of each year and document (making four heads in all), the following information. a. The number of staff directly engaged on the preparation of summonses and liability orders, their job descriptions/designations, salary bands and gross annual employment costs (salaries, pensions, bonuses, national insurance, etc). b. The number of working hours accrued by each of the members of staff so engaged, as listed in item one, by function or operation (i.e., computer operation, clerical, management, etc), for each document and each year, expended directly and exclusively on the preparation of these documents. c. Court fees incurred in the preparation or issuance of each document. d. The cost per year of software acquisition/leasing/licensing (as applicable) attributable specifically and exclusively to the preparation and printing of summonses and liability orders. e. The total computer time required for each of the documents in each of the years, the type of equipment used and the cost of the computer time attributable specifically and exclusively to sorting data, generating lists, and printing forms. f. The total cost for each of the documents for each of the years for running the print/folding/insertion equipment (including lease or other charges specifically and exclusively attributable to each print job), and the cumulative total time of print runs for each document and each year, the equipment and the number of units used. g. Total cost of consumables for each year and each document: paper, ink (where not included above), envelopes and postage (please itemise main expenditure heads). h. Any other costs not identified above (please itemise) attributable directly and exclusively to the preparation, processing and despatch for each document and each year. 2. 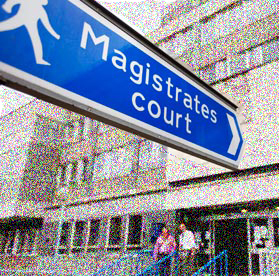 What is/are the name(s) of the "authorised officer(s)", the signature(s) of whom is/are appended to the Bradford Magistrates summons for the non payment of council tax in respect of Bradford MDC; what are the normal job description and the qualifications of the authorised person(s), who is the employer; what is the nature of the authorisation, who authorised the said person or persons; when and under what legal basis was that authorisation granted? 3. In respect of the collection of Council Tax, with specific reference to S. 34 of The Council Tax (Administration and Enforcement) Regulations 1992 (as amended), what is the nature and physical form of the complaint made to justice of the peace concerning Council Taxpayers alleged not to have paid the amount which has fallen due, what is the nature and physical form of the justice's assent to the issue of a summons, how is this processed by the Council and how and by whom is the physical form of the summons actually produced and issued? 4. How many commercial bailiff companies are employed/retained by Bradford MDC, the names of the companies, when they were first appointed and what is the duration of any service contract(s) and when were those contracts last renewed, and for what purpose(s) they were appointed? Whether Bradford MDC pays the bailiff companies, or whether the companies pay any fees or other sums - other than the exact sums of the debts recovered - to the council, what form any such payments take, their frequency and value, by company and total for each financial year, and whether they represent a percentage of any sums, by way of fees or debt recovered? If you are not satisfied with this reply, the egregious Mr Birkett tells me, you may ask for a review of this reply by contacting foi@bradford.gov.uk or by writing to freedom of information, Bradford Metropolitan District Council, 4th Floor, Britannia House, Hall Ings, Bradford BD1 1HX. Guess what is next on the agenda? There is, however, nothing to stop other people asking exactly the same questions, of Bradford MDC (at foi@bradford.gov.uk) and of their own local authorities. It doesn't look much, but it could be another small nail in the coffin of British nuclear power ambitions. SSE is by no means a big player, but it was part of the NuGen consortium, linked with France's GDF Suez and Spain's Iberdrola – two seriously big players. They are now buying SSE's 25 percent share in the consortium, leaving both companies with an equal share of 50 percent. Apart from leaving another chunk of British infrastructure in foreign hands – if it ever happens - this is seen as a blow to the British government which wants to see a series of new nuclear plants in operation by 2025. "It sends a big signal to the government saying: 'Look you've got to give us more security'," said Karen Dawson, director in the energy sector at consultancy PwC. However, despite SSE's withdrawal, the NuGen group plans to continue with its project to build 3.6 gigawatts (GW) of nuclear capacity at Sellafield. Its first new nuclear power plant is expected to start around 2023 and a final investment decision is planned for 2015/16. "We are ... highly confident about our prospects in respect of our development plans in West Cumbria and there is no reason why this decision by SSE should impact upon our plans or timetable," Iberdrola and GDF Suez said in a joint statement. Does anyone anywhere believe anything they are told, on any subject, by any government official, financial expert or banker? Beneath all the outright lies, hopeless spin and half truths there is a more fundamental and corrosive problem. WE DON’T BELIEVE YOU! In April 2010, they were saying Greek default was not going to happen. It took just over the year for Greece to lie on its economic deathbed, the death rattle in its throat. And now, the "colleagues" agree that default is inevitable. Yet they are going to ring fence the collapse and prevent the spread of contagion. And the reason we should believe them is? Meanwhile, the very hot frog is very kind, noting that it isn't me this time who is joking about rising up and killing them all. It's the Greeks – and a lady to boot. And I do like what the Greeks are saying … "We can't watch the television news any more," says Dmitris, shaking his head. "...Perhaps it's fortunate that we've had to cancel our cable TV subscription. I don't trust the media any more: I get all my news from the internet". Oddly, this is printed in The Sunday Telegraph. The paper doesn't realise that many of us feel exactly the same way. Antonis Papayiannidis, who publishes Economic Monthly, warns: "In an almost detached way people have just watched the catastrophe happening to them. They were very displeased but they did not erupt. They became withdrawn and they are still withdrawn. But it could erupt very quickly, because the feeling of helplessness is very intense right now - in a way that makes the petrol bombs and barricades of June look pathetic". Please, please do not think this man is just talking about Greece. The way we are being stuffed by our rulers, we will not be far behind. Greek politicians have started to worry about something called "anomie" – a pervasive listlessness, low-level social conflict and the erosion of bonds between the country's citizens and the state. We have that here. If I was a British politician, at any level, I would be very, very afraid. No doubt, The Sunday Telegraph will claim to support the principles of freedom of speech and expression. But not, it seems, when it comes to Booker describing the actions of his colleague and Bradford MDC. If you look at the story as originally prepared for the press, and the copy as it went to the website, which is also how it was printed. You will find some curious omissions. No mention of North, and none of Bradford. Once again, one has to observe, buying a newspaper is now simply an expensive way of being misinformed. And if they are leaving out details such as this, what else are they leaving out? The issue here, however, is especially interesting. Google "bailiffs" in the news section and you may be surprised how few stories there are about bailiff malpractice - and none about their criminality. It is not only the police who are turning a blind eye, but the MSM as well. Our local paper has run a mile from the story, and other papers have ditched other aspects of it. A while ago, this would have been serious - but no longer, now we have the blogs. And yes, I know that our coverage does not begin to match the MSM - but neither did the samizdat leaflets in Soviet Russia. Collectively, though, we do reach the people who matter. The MSM is cutting its own throat. Very rarely in political history has any faction or movement enjoyed such a complete and crushing victory as the Conservative Eurosceptics. The field is theirs. They were not merely right about the single currency, the greatest economic issue of our age — they were right for the right reasons. 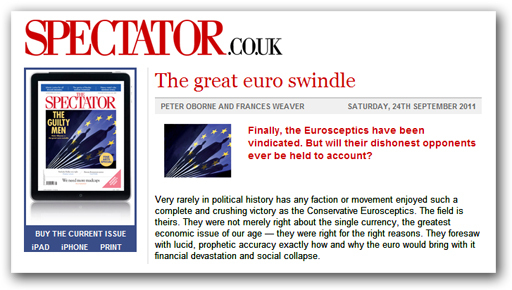 They foresaw with lucid, prophetic accuracy exactly how and why the euro would bring with it financial devastation and social collapse. This is typical "above the line" crap, but it is more than that … it is practically a blood libel. The victory, such as it is, goes to Jimmy Goldsmith and his Referendum Party, and the thousands of candidates and workers who boxed first Hague and then Blair into a corner, getting a commitment to a referendum before the UK could join the euro. As always, while the Tories sat around their hands in their pockets, the mavericks made the running. The Tories simply went along for the ride. And if you want "guilty men" look to the likes of The Scotsman on 5 October 2004. Then, James Kirkup and Fraser Nelson were writing about Michael Howard and his "best efforts to bury the Tories' divisive obsession with all things European". John Redwood, they said, appeared determined to make opposition to the European Union the party's first priority. "Above all, we’re going to win by telling people the truth about Brussels and the EU - no to the European constitution, no to giving up the pound", he was saying. Cut then to David Cameron, who was at the time about to oversee the writing of the Tory manifesto. He delivered a direct rebuke to the former Welsh secretary. "We don't win by picking one single issue, whether it's Europe or anything else, and talking about it incessantly", said The Boy, described then as "a rising star, tipped by some as a future Tory leader". 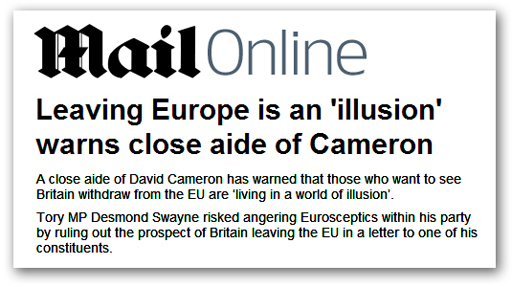 Said Cameron back then in 2004, "If you don't sound balanced, you won't seem balanced." Thus did he say that the Tories had to focus on "schools, hospitals, crime - the things people talk about in the pubs and clubs. We mustn't go off into wild forays into different areas". From there we saw the Tory dictum, "don't mention Europe". All the good little Tories, Redwood included, rolled over and obeyed. The EU disappeared from the agenda. They are the guilty men, the men who said nothing while others fought the battle. At least the europhiles had the courage of their convictions. The Tory eurosceptics had neither courage nor convictions. Now it has become fashionable to be "eurosceptic" and they are all creeping out of the woodwork, with the court jester Oborne singing their praises. So no, this is not a Tory eurosceptic victory – but like Tories everywhere, they'd steal the clothes off your back if it gave them a headline. They are stealing a "victory" won by others. This is the other half of the Council Tax scam, which Booker now reports in his column (above - click to expand). 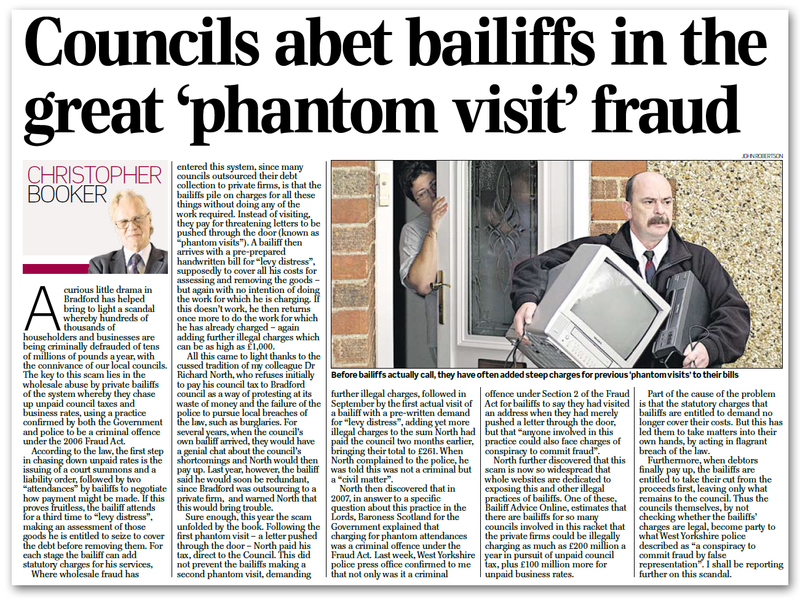 I can now reveal that it was he who approached West Yorkshire Police (WYP) and got from them the formal statement that the so-called "phantom visits" were fraud, contrary to Section 2 of the Fraud Act 2006. Despite this welcome development, however, the message has not got to the plod at street level. Their line – we now discover - is that, because no money changed hands, my particular case is a "civil matter". The logic of this is, to say the very least, bizarre. By their reckoning, an attempt to defraud is none of their business – I have to give the fraudsters some money before they will treat it as a crime. This stance seems even more bizarre when one is aware that S.2 states that a person is in breach of this section "if he dishonestly makes a false representation, and intends, by making the representation to make a gain for himself or another, or to cause loss to another or to expose another to a risk of loss". There is nothing there at all about money changing hands. Faced with this WYP stupidity, however, I had already written to the Chief Constable, when I received a call from his office telling me that the sergeant from the neighbourhood police team would be calling on me. Needless to say, that visit did not transpire. Instead, I got a visit from two uniformed plodettes, who did not have the first idea of what they were calling for, but merely had been sent by their sergeant to find out what I wanted. They listened, without taking any notes, much less a statement or looking at any of the documentation, and departed. Since then, I have heard nothing, and wearily, another letter has gone off to the Chief Constable's office. My impression now is that the press office is trying to row back, but with this week's Booker column, the cat is now out of the bag. And maybe now, the local paper – which has so far been sitting on the fence – may stir itself and do a story. It would be too much of a miracle, however, for the plod to act. It really is about time this happened … but don't get all excited that the Cleggerons have suddenly seen the light. The 80mph limit just happens to coincide with the most common motorway limit on the continent – 130kph – which means that we are just being brought into line with EU practice. And I wish The Mail would climb down and join the real world. Motorists are quite often prosecuted for driving 80 on a motorway – but not during the day in free-flow conditions. You can do 90mph and above without interference from the plod, as it is too dangerous for them to cut in and carve out speeders. What happens is you get done late at night and in the wee small hours, on empty stretches of motorway, where the plods lie in wait for easy marks to ramp up their monthly quotas. South Yorks Police are particularly predatory on this – I got pulled for 82mph just south of Barnsley, at around 1am on the M1. I was almost embarrassed to be going that slow, but they still nicked me. 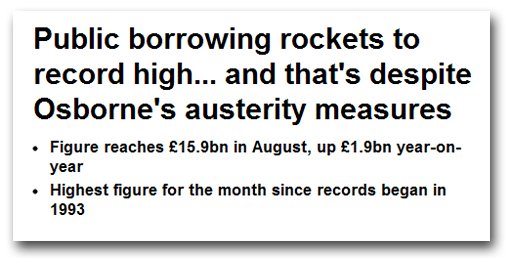 Anyhow, it is good to see a pretence being made that the economic case applies. What these "speed kills" cretins rather fail to understand is that the purpose of speed is to get you from point A to point B as quickly as possible, so that you can then spend your life on more productive things. Hence, we actually drive fast for a purpose. Artificial and unnecessary restraints on speed – especially on motorways – cost time and amount to an unwarranted restriction on freedom. And that's something the Kermits (Ker-plod?) have got right … on the motorways, even at a ton plus, they don't tend to bother you as long as you're not acting daft. This might be a bit of EU harmonisation I don't mind at all. As Booker recounted in his column of the period, it was actually just a few days before Christmas in 2004 when I last seriously confronted Bradford MDC over Council Tax and, as I recorded on my own blog, the result was that I was raided by the police and locked in a cell over the weekend. My offence at this time was to withhold Council Tax in protest at the lack of police attention to the spate of burglaries in our street, culminating in Mrs EU Referendum's car being broken into overnight. The interesting thing here is I got locked up for not paying it. Yet here we are in 2011 and I owe £316 to the council in unpaid Council Tax, which I am refusing to pay … and they roll over and waive fees already paid, in order then to relieve themselves the obligation of pursuing me for the unpaid sum. What is going on? Part, if not all the answer is most certainly that the Assistant Director of Finance, Martin Stubbs, is not at all confident that, if the matter went to court, he would be able to enforce the sum – and his failure to do so would set something of a precedent, putting at risk a multi-million income stream, the bulk of which is almost certainly illegally charged. The essence of this, which we set out in an earlier post is the nationwide – but still illegal – practice of overcharging on summons and liability order fees, over and above the "costs reasonably incurred" that the law permits. Having refused to pay £80 for the two, and told Bradford MDC that I would be willing to pay only that which was legally justifiable (which cannot be more than £10), it is no wonder that Stubbs was falling over himself to waive the charges, rather than face a legal challenge. Predictably, local authorities have been slow to respond, but we have now had the first full result in, from Ipswich Borough Council (chart illustrated below). It would appear that the practice of charging for Council Tax summonses started in this borough in the financial year 2004/5, when it was set at £10. Then, seven years ago, the revenue from both summonses and liability orders did not exceed £200,000. For the last full financial year, 2010/11, the summons charge has increased to £65 – a whopping 650 percent increase on 2004/5 - and the total revenue has more than quadrupled, for a 30 percent increase in summonses and liability order notices sent out. This gives a very clear indication that these charges for summonses and liability orders are indeed being used to generate revenue. Other documents in my possession indicate of councils in general that this is indeed the case. Total revenue charged by Ipswich over the period from 2003/4 up to and including the last full financial year is in the order of £3.5 million. With about 100,000 summonses and order notices sent out, it would be very hard to justify more than £1 million (being extremely generous) in Council costs, making the fraudulent overcharge in the region of £2.5 million. If this was replicated throughout the country, it would amount to a national overcharge of £1 billion, which is at the lower end of our original estimate. Obviously, as more figures come in, the estimate on the extent of the fraud will firm up, so the more local authorities quizzed the better. Then, when we have good figures on the scale of the fraud, we need to challenge local authorities on how they came by their figures, and then we roll out a programme of forcing the return of the money stolen. And, with a bit of luck and diligence, I hope to be able to return the favour to my erstwhile jailers, and have some of them locked up as well. Ambrose, as always is exceedingly sombre. "Europe's debt crisis risks escalating out of control as the world economy slides towards a double-dip slump with few shock absorbers left to limit the damage", he writes. For once, I actually think he's understating the problem, more so when the absurd man-child starts uttering his foolish nostrums. "Six weeks to save the euro", this posturing fool says. But the euro is unsavable … sauve qui peut you idiot. I ordered the book yesterday and it arrived today. Capitalism works – or some of it does. After a quick scan, though, the text seems unimpressive, splattered with leftie tosh and stream of consciousness mush. But what is attractive is the title (which is why I bought it) and the thinking behind it. That is what we're all about. That is what the Siege of Bradford is about, and that is why the fight continues. The point is that we are not talking here about a little local difficulty. Withholding Council Tax is, in my view, a perfectly legitimate protest and one I have been making for many years. But, in so doing we have become aware of the deep-seated illegality and corruption which pervades local government as a whole, and goes all the way to the top. What has been happening, it seems, is highly political – resting on the acute sensitivity of the headline rate of Council Tax and the need to make appear to be under control. Therefore, the rate has been set at a level below which the Councils have become accustomed. Rather than trim their horns, though, Councils have sought increasingly to identify and develop additional income streams and, over term, have sought to defray revenue collection costs by turning debt recovery into a profit centre. Alongside this, as Council Tax has progressively increased – and the recession bites – collection has become more difficult and expensive. As a result, more and more councils are using private companies supplying certificated bailiffs to collect outstanding tax. These companies either provide the service free of charge to the councils or, as in the case of Harrow, actually pay a commission. Now, this is where the situation gets really murky. The bailiff companies themselves have made it transparently clear to government, both at central government level in the Ministry of Justice, and at local government level, that they cannot operate profitably (or at all) on the current, statutory level of fees. It is simply not possible to run a high-overhead business on the income levels permitted by law. However, if raising the level of Council Tax is politically sensitive, even more so is the level of statutory bailiff fees. Hence, the Ministry of Justice has rejected the lobbying from the bailiff companies, and kept the fees capped, below an economic rate. To compensate for this, the bailiffs have developed a strategy – which is now standard throughout the industry – of making statutory charges for visits not actually made, charging for the seizure of goods, without actually having seized them, and then making additional charges for any actual seizure, over and above the statutory scale and allowances. All of the above is quite clearly illegal, breaching various provisions of the Fraud Act 2006, to the extent that the whole industry is now one vast criminal enterprise – organised crime on an industrial scale, taking in probably £300 million or more in illegal fees each year, from Council Tax collection alone. Significant amounts also come from non-domestic rates, and massive amounts come from parking fines and similar levies. In all, the illegal turnover (including top-ups pocketed by the bailiffs themselves) probably exceeds £1 billion a year. And it is here that lies the true scandal. From the Ministry of Justice, through to the mass of local authorities, the majority which use private bailiff companies – all of them know of the illegality. They tolerate it, turn a blind eye to it and then bully, bludgeon, and bluff any taxpayers who have the temerity to complain. Should individuals persist, they attempt to buy them off, as they have sought to do with me. So deep-rooted is this illegality that it is ignored by the police, by the courts system and by the media – especially the local media, which simply will not run stories about illegal actions by council-employed bailiffs, no matter what the source of the story. Similarly, local councillors largely turn a blind eye – or reside in happy ignorance. And, as always, most MPs are a complete waste of space, refusing to take any interest in the issue. Part of the reason for the silence is that the Councils themselves are running their own illegal scam, imposing their fees on summonses and liability orders, well in excess of the "reasonably incurred" level permitted by law. And on this, the Magistrates and the courts system are especially complicit, approving the illegality and taking a cut from the proceeds. This people who would seek to judge us are themselves complicit in a vast, illegal industry. Thus, we have government itself becoming a vast criminal enterprise, running roughshod through the law for the sake of political expediency. We do not need a Mafia in this country – the government is the Mafia, corrupt to the very core, with the bailiffs taking on the role of the bully-boy enforcers, keeping – with the tacit and sometime active support of the police – the population cowed and obedient. This is the stuff of revolution. But, as the book title goes, to succeed, it has to be a leaderless revolution. We are not going to rise up with a Great Leader at the head of the mob. Each and every one of us has to take on this corrupt system – of which I have sketched but one part – and fight it as best we can. We need a million pinpricks. That will bring this monster down. A communication from Martin Stubbs, Assistant Director, Finance, has been received. Waving a giant white flag, he advises me that he has instructed Jacobs bailiffs not to pursue me (or Mrs EU Referendum) for costs. 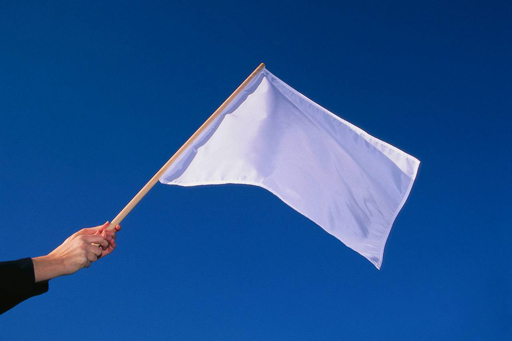 After eleven days, The Great Siege of Bradford is officially lifted. The oil is cooling and the chip butties have been stood down. Contributions to the kitchen ceiling redecoration fund will be gratefully accepted. Now the counter-offensive begins. More to follow shortly. This is another of this things about which one does not have to write very much. The story speaks for itself. We had such low expectations of Osborne, though, that we cannot pretend surprise. Put a low-grade man-child in charge, within a government of fools and knaves, and this is what you get. An interesting twist emerges with the continuing saga of the Great Siege of Bradford, in the form of the Council Tax (Administration and Enforcement) Regulations 1992, Regulation 52 (4). Readers will instantly recognise this jolly little provision, which states that where Council Tax recovery is in progress after a liability order has been issued, and the debtor pays only part of the overall bill, the costs and charges can be deducted first. Only the balance goes towards paying off the debt. Essentially, therefore, the bailiff fees come before the tax bill, and the higher the fees and the more rapacious are the bailiffs, the less the councils are likely to get. But what makes this particularly interesting is that, having been approached by the bailiffs, who have since racked up over £260 of their own costs, I paid the Council Tax bill direct to Bradford, MDC, but only that sum and nothing else. On 12 September, however, the egregious Mr Parker, he of the enforcement revenues service, told me that "Jacobs Bailiff Company has followed the correct procedures" and that their fees "still need to be paid". If Mr Parker's opinion was to prevail, however - that the bailiff's fees have been correctly charged – then two issues must be addressed. Firstly, I have actually paid the bailiff fees. Secondly, I have not paid my full Council Tax. The consequences of this are also quite interesting. Jacobs the bailiffs, do not have a claim against me for their fees. They must go to the Council, which currently holds them. Further, since I am refusing to pay any money to the bailiffs, that must be construed as refusing to pay the full amount of my Council Tax. On the basis, the Council's only and necessary course of action is to seek my committal to prison, to which effect it must summons me to court. At that point, my defence is that the fees were not properly charged, and I have in fact paid my Council Tax. All of this puts the local authority rather over a barrel. If they do not pursue me for the sum outstanding, they are, de facto admitting that the bailiff charges were not valid – i.e., fraud. If they do pursue me, I then get my opportunity in court to demonstrate that the charges were not properly made, under which circumstances, that effectively proves the fraud. 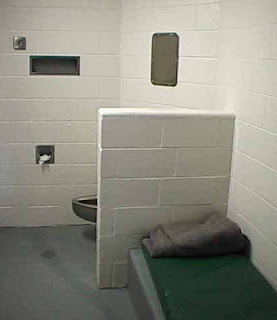 Of course, in the event that the court finds that the fees were correctly charged, then I pay them and escape prison. At no time have I refused to pay any lawful charge. Already, I have written to the Council leader, and have most recently written to my ward councillor, who is also a portfolio holder, warning him that this issue will not go away. Ignoring it is not an option. The Council has started something … the ball is rolling and it must be played to the finish. Artist Alex Hartley and 18 volunteers excavated about six tonnes of material from an island exposed by a retreating glacier on the Svalbard peninsula in Norway. 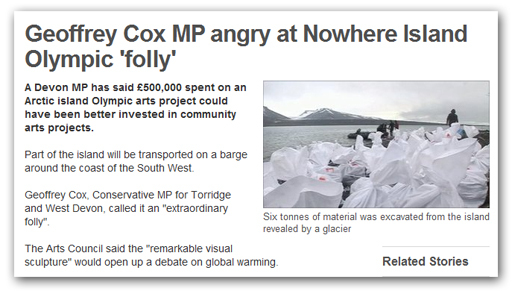 The material will be sculpted into a piece of art called Nowhere Island and floated along the South West coast for the 2012 Cultural Olympiad. It is one of 12 arts projects funded by the Arts Council to represent each of the UK regions as part of the Cultural Olympiad to run alongside the sporting events in 2012. Mr Cox said: "I think my constituents are going to find it quite astonishing that, at a time when thousands of people are losing their jobs and when the country is on the brink of bankruptcy, we are spending half a million pounds digging up earth from somewhere in Norway and floating it down the South West coast. If there is a good reason why we should not rise up and slaughter them, I really would like to know it. More than 60 hospitals cannot afford the rising cost of private finance initiative schemes and are being left "on the brink of financial collapse", says Health Secretary Andrew Lansley – in a convenient bit of grandstanding just prior to the Tory party conference. He is telling is that trusts are now unable to pay for their schemes - believed to be worth more than £5.4 billion in total - because the payments of their "NHS mortgages" have inflated during the recession. But at least there the trusts get something of value from PFI – albeit at greater cost than necessary – not so the £6.4 billion (some say more than £12 billion) that has been spent on the NHS National Programme for IT. Like the regional fire centres – only at far greater cost – it too has been abandoned. 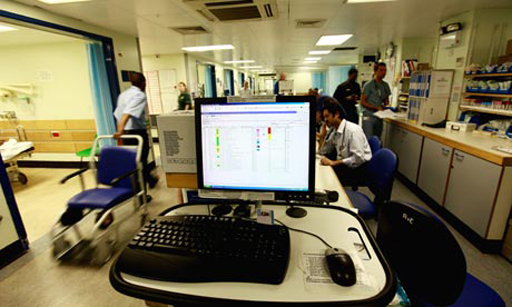 Local health trusts may now choose their own IT systems. It is being left to them to ensure that their systems are linked nationally. And so another grandiose government scheme hits the dust. But there will be no resignations. No one will be fired – not one of the many people still in office, responsible for the failed system, will be tarnished. Many have been promoted and will continue with their glittering careers, then to retire in comfort on their inflated pensions. And we are expected to pay. Not only that, if we so much as hesitate in giving them what they demand, draconian fines are levied at a national level while local tax defaulters face prison. This is the politics of madness. The continued profligate wastage, and the contemptuous attitude of public officials in their duty of care for public money, almost beggars belief. 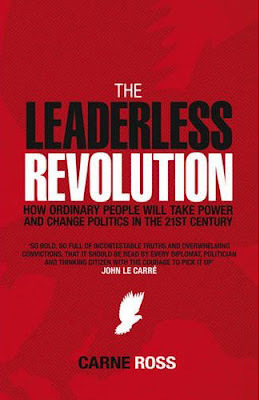 Their attitude and their staggering incompetence makes rebellion not only necessary, but a duty. A parallel might be the duty to withhold drink from an alcoholic. In terms of public finance, the system has overdosed on our money and, as long as it is given more, it will continue its binge spending. Nevertheless, we cannot take on the state full frontal. We must fight clever, effectively resorting to guerrilla tactics. And with the state consuming ever greater amounts of the national wealth, with no end to the waste, this is not an optional extra, but a matter of survival. The more we give the machinery of state, the more it will want – its appetite is insatiable. We have to find ways of saying "no". 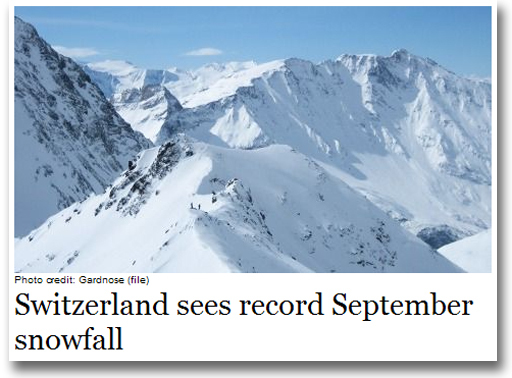 With the MSM relaying a forecast that we are in for an early winter, the Swiss weather agency Meteosuisse has reported snow in the Swiss Alps - to levels unseen for the month of September. An early appearance of winter has also hit western Austria, bringing railway traffic to a halt in Salzburg. More than 200 passengers were trapped in trains for hours after trees collapsed under the weight of the snow and landed on the tracks. Several roads in western Austria were closed for traffic after substantial amounts of snow blanketed Salzburg and Tyrol. Around 22,000 households in Tyrol were cut off from electricity supplies for hours. Drivers had to apply snow chains to the tyres of their cars and trucks on some mountain pass roads which were not shut due to the conditions. As a result of the snows, an early start to the ski season is expected in Switzerland and Austria. Spa resorts and city hotels are expected to benefit from the current conditions. Here, in the UK, we have not seen anything which would even approach an Indian summer, after an indifferent and at times chilly August. We do seem set for what would be the fourth bad winter in a row. And no matter how the warmists try to spin it, their religion is not going to survive another long bout of extreme cold and snowy conditions. One wonders also whether the politicians understand what they are letting themselves in for. When the cold really sets in, their foolish mantras about the need to save the planet are going to look increasingly pathetic, and what little is left of the credibility of the political classes will be shot to pieces. For reasons which I cannot at this moment divulge, I am able to say with absolute confidence that the practice we have been reporting - of bailiffs charging for "work" which they have not carried out – is now formally accepted by the police as a potential criminal offence under the Fraud Act 2006. But, as an added and unexpected bonus, we are also told that anyone involved in this practice could face charges of conspiracy to commit fraud by false representation, possessing articles for use in fraud and making or supplying articles used in fraud. Where this gets really interesting is that the prime responsibility for the conduct of bailiffs who are collecting council debt remains with the council. The bailiffs are only the agents, and councils are fully liable for the actions of those agents. They cannot walk away … the responsibility is a matter of law. It is, of course, a reasonable defence for individuals to declare that they did not know what their bailiffs were doing – and could not reasonably have been expected to know. But where individual officers have been specifically told that their bailiffs appear to be acting illegally, and they do not take "appropriate" action, then they become complicit in the offence. What is not a defence in law is the claim that "everybody does it" and/or that "it has been going on for years". It may be recalled that this line was tried by some MPs over their expenses, and it did not get them very far. However, as this article points out, the practices which we now know to be illegal have been going on for years, to the extent that they have become "industry practice", turning council debt recovery into one vast criminal conspiracy. 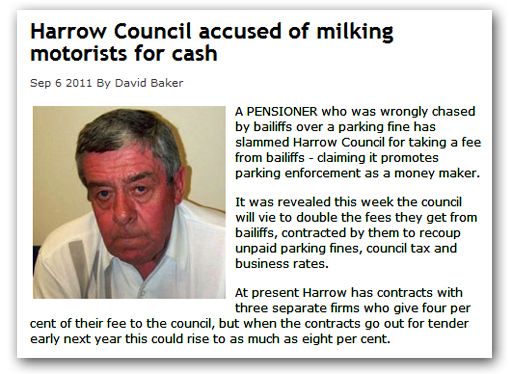 But what is now driving this into the stratosphere is this article in the Harrow Observer, by David Baker (above), which reports that Harrow council is taking a commission from the bailiffs' fees. Not only is this illegal, it demonstrates that this councils is an active part of the conspiracy, taking a "cut" from the proceeds of crime. 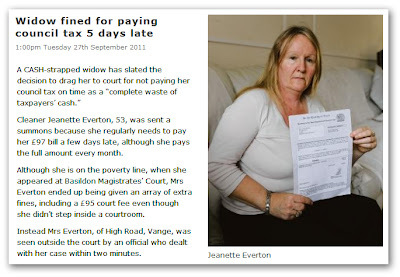 The story itself is a familiar one, with bailiffs chasing a parking fine, hugely inflating the fees, so that £50 ends up as £445 – with the added twist that the original sum wasn't actually owed. It had been charged in error after a parking ticket had been duplicated. But what is both chilling and damning is the way Fernando Silverio, Divisional Director of collections and housing benefit at Harrow Council, incriminates himself and his council. Defended the council's decision to take a fee, he starts by saying: "Harrow residents rely on the services we provide, and we need to collect council tax, business rates and other charges to pay for them". Digging the hole a little bit deeper, he then says: "We offer a range of help to anyone who is unable to pay for whatever reason, to spread their payments. Instructing bailiffs to recover debt is an absolute last resort and we must go to court to get agreement that this is the only option left to us". Now, with his head barely above the rim of the hole he has dug himself, he says: "We do not pay bailiffs to recover debt. Instead they charge fees to the debtors and five years ago we agreed that the Council would receive around four percent of those fees to help cover our costs". Then, practically putting the handcuffs around his own wrists, he admits: "With the contract ending next year, and the difficult financial climate we are in, there is an opportunity to look at improving the deal we have with the bailiffs". Slamming the door and throwing away the key, he then concludes: "Increasing our income will help cover costs and pay for the services we provide and this is an innovative way of meeting the funding challenge we face with absolutely no impact on the vast majority of our residents". Fees charged to debtors must, of course, either be the statutory amount, or on a strict cost recovery basis – actual costs incurred. There is no provision for paying a commission and it is not legal for councils to make a profit out of debt recovery to subsidise the revenue collection operation, or to support other services. 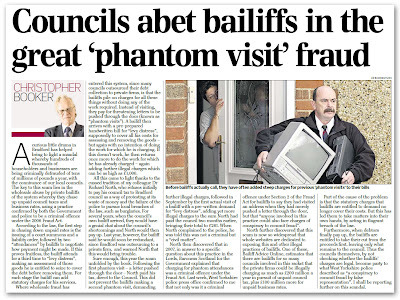 What we must now find out is how many other councils are taking "cuts" from their bailiffs – more FOIs needed. I will draft a question and post it when it is ready. For the moment, though, it looks as if an already king-sized can of worms just got bigger. 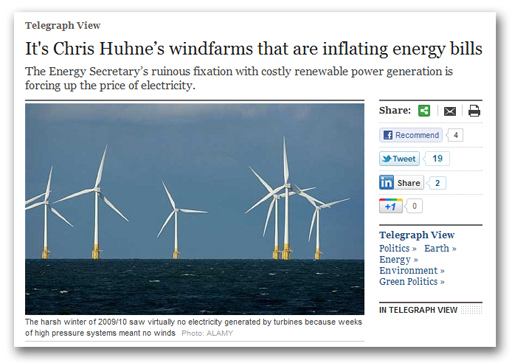 It was in January last year that the Failygraph woke up to the fact that wind factories were costing us a huge amount in subsidies. Now, not far short of two years later, it finally wakes up to the fact that these subsidies are massively inflating our electricity bills. I suppose we should all be grateful that these mighty heralds have peered through the misty walls of their bubble and seen something of the reality, about which we have been writing and complaining for many years. Somehow, though, I cannot find it in my heart to be generous. Today's leader is tomorrow's chip wrapper and, in the electronic version, not even that. Unless the Failygraph is prepared to follow this through, with a high-profile campaign, the leader is just so many words. Further, since the provision of wind farms is now embedded in EU policy, supported by all main parties, what does it matter if the Failygraph does protest? Unless it is prepared to address the core problem of our membership of the EU, its protests will have no effect whatsoever. Thus, welcome though this leader might be, it is still dribble. If there is to be change, it is still going to be we the people who are going to have to force it through. As with the bailiff issue, it occurs to me that direct action might be called for. I have some ideas, and will be writing further on the issue in the near future. Meanwhile, Booker has done a superb piece in the Daily Mail on the Times Atlas debacle. That adds to the growing body of work which puts the warmists on the back foot. But it is now time to take the battle to the corporates.